I think you have mis-interpreted the intention of Sina in putting the donation amounts online. I don't think there is any intention to press the foreign companies to donate more. There were rumours posted in online forums that some foreign companies had donated very little. Those people also called for boycott of these foreign countries. These rumours were immediately refuted by making reference to news articles about the donations of foreign companies. The page by Sina is also a very good reference for refuting such rumours. Just one more comment. Before that, let me express my appreciation for your help to the Chinese people. 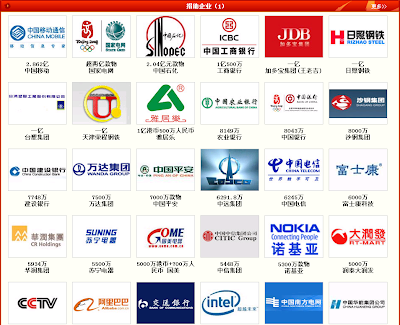 Regarding the criticisms on the foreign companies you mentioned, I don't know if you have read those discussions yourself or just from the online news sources. What I want to point out is that all the online news sources about such criticism came from a single dubious article of the Associated Press. It started out from a single blogger who criticized some foreign companies of doing too little (with some incorrect amounts quoted and those amounts were very small). Other people posted his comments (which was a rumour) on online forums. Many people readily pointed out his errors and said this idiot was doing a big disservice to the Chinese people, although some nationalistic comments supported that idiot (probably due to the previous olympic touch issue). But anyway, nobody really cared about this issue. Then Joe Mcdonald of Associated Press wrote an article which suggested that such criticism was widespread and that this was what most Chinese think. That whole article is complete nonsense. Out of his own prejudice, he said the Chinese government took an unprecedented step in thanking the companies from other countries because of such criticisms. What's wrong in thanking the foreign companies? And this is certainly NOT unprecedented. What is unprecedented is the help from all the foreign companies! It is all too natural to thank them! The Chinese government also thanked a lot of different countries. How could such a normal thing be interpreted as the response to the criticisms of just a single blogger that nobody really cares? This single article from AP got carried over by all other "news sources". This is a disturbing trend in online news publishing. A single article could easily get carried over to all other "news sources" and it looks like the whole world is reporting the same thing. This is not the first time this happened to articles from the AP.